Seton Hall enters the game now on a two-game winning streak with a record of 8-7 in Big East play, fifth in the conference and an overall record of 19-9. 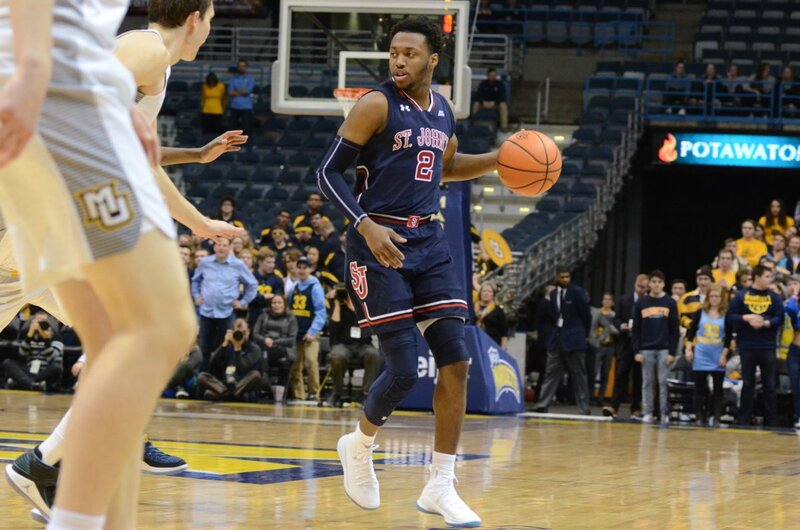 St. John's dropped to 3-12 in Big East play (14-14 overall) on Wednesday night, and is now locked into the bottom four of the conference, meaning they will have to play in the first round of the Big East Tournament on Wednesday, March 7. They will have to win four straight nights to capture the tournament and try to be like Connecticut in 2011, a low seed that won five straight at the Big East Tournament that season and eventually won a national championship. Marquette, who improved to 7-8 in the Big East and 16-11 overall, led by as many as 20 points in this one with 3:12 left in the game. The Golden Eagles were led by Sam Hauser, who had 24 points on 9-14 from the field, including a superb 5-7 from beyond the arc, with five assists, three rebounds, and two steals. Andrew Rowsey had 19 points (7-16 FG, 4-12 three-pointers), eight assists, a rebound, and a steal. Jamal Cain, Greg Elliott, and Sacar Anim had 11 points each. 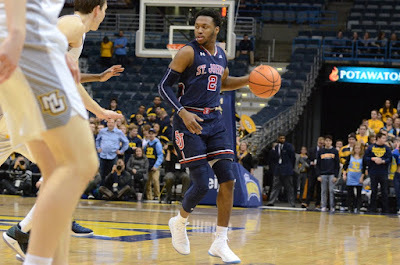 For St. John's, Shamorie Ponds, who came into this one averaging 32 points a game over his prior five performances, had 19 points. At this point with Ponds, though 19 points is a nice number, it can be said that Marquette kept him in check, especially considering he shot just 5-18 from the field and 4-7 from behind the arc. Bryan Trimble, Jr., matched Ponds with 19 points of his own on 7-9 from the field and 5-7 on threes, in 32 minutes off the bench. Justin Simon had 14 points (5-8 FG, 1-2 on threes) with six assists, five rebounds, and a steal, but he committed five turnovers. This game was basically decided at the three-point line, as Marquette shot 54.2 percent, or 13-24, from behind the arc, while St. John's was just 11-26, or 42.3 percent on threes. This game began on Wednesday night at the Dunkin Donuts Center in Providence, but was suspended at the 13:03 mark of the second half with Seton Hall leading 56-47 due to unsafe floor conditions. Seton Hall star Desi Rodriguez hurt his angle as he slipped making a cut to from the baseline late in the first half and had to leave the game. He had nine points in this one on 3-7 from the field, including a three-pointer. Seton Hall Head Coach Kevin Willard said Rodriguez will miss Saturday's game vs. St. John's and they hope to have him back for their home game against Villanova on Wednesday night. When two more Seton Hall players hit the deck, including one simultaneously with a Providence player, Willard had seen enough. The game resumed at noon on Thursday at Alumni Hall on the Providence campus. As expected, Providence came out energized and they cut it to a point, 59-58, on a Kyron Cartwright three-pointer at the 8:50 mark. Seton Hall's Ismael Sanogo came right back with a three of his own, and that was the start of a 9-1 run capped by a Myles Powell three that made it 68-59 with 6:43 left. Myles Cale stepped up in a big way, as he scored five straight for The Hall to make it 77-66 with 2:51 left. He had eight points on 3-4 from the field, and a rebound in this one. Khadeen Carrington's jumper with 1:25 left made it 81-71 and basically sealed the win for the Pirates. Carrington led Seton Hall with 25 points on 8-13 from the field, `1-2 on threes, and a perfect 8-8 on free throws, with three rebounds, two assists, and a steal. Myles Powell finished with 20 points (6-12 FG, 4-6 threes), with four assists, a rebound, and a steal. Angel Delgado racked up another double-double, the 69th of his career and 19th of the season. He had 14 points (6-10 FG) and 11 rebounds, as well as a couple steals and a pair of assists.